As previously expected, according to rumors, during the preliminary press conference IFA 2013, Samsung introduced a new flagship Galaxy Note 3 and the Samsung Galaxy Gear SmartWatch, which is marketed as "the perfect companion for your Note 3". With a good design, Galaxy Gear, luckily, it looks much better than the previous attempts of the company, as it is not so bulky and uses a chrome insert that, at least give an idea of ​​the quality of the device. Gear screen size is 1.63x1.63, it is equipped with Super AMOLED and boasts a resolution of 320x320. Exact dimensions are 36.8x56.6x11.1mm, and it weighs 73.8g. In addition to the obvious function as hours of work, Galaxy Gear will work better with the Galaxy Note 3 and, as expected, will be compatible only with "some" smartphones Galaxy. It seems that the company has taken the practice guide of Apple. In contrast to previous rumors, Galaxy Gear does not work on Android and need to be connected to the device Galaxy. It will work with the Galaxy S III and S4, Note II and 3, as well as a new Note 10.1, which was also announced at the IFA 2013. All mentioned devices need to update the software. 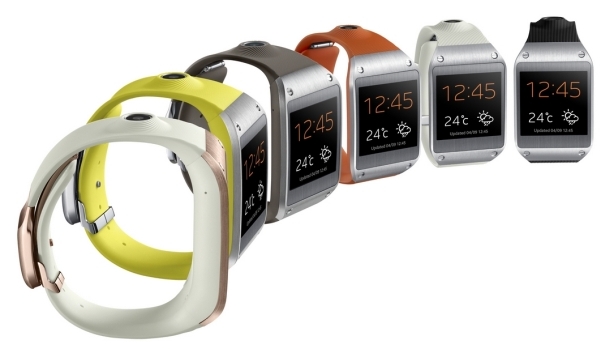 The main function of Galaxy Gear is to show you the incoming messages, such as calls, texts, emails, and other warnings, as well as a preview to put these messages. It also comes with a rather unique intelligent features that automatically transfers all that is on the screen Galaxy Gear straight to your smartphone Galaxy, when you unlock it. Basically, if you look at the preview of messages and unlock the smartphone, the same message will appear on the phone. As expected, there will also be available to the voice command that can be used to make a call and talk even with Galaxy Gear, using built-in speaker and microphone located at the bottom of the belt. They also allow you to make voice notes, set an alarm, in general, to do basically anything you can do with voice commands. Galaxy Gear blocks the smartphone automatically if you move it more than 1.5 meters from your smart phone and will even help you to find it using the Find My Device. Also available will be some expected tracking health, but, surprisingly, a device does not have enough heart rate monitor. At the moment, Samsung has unveiled that Galaxy Gear is powered by a 800MHz processor unknown brand is paired with 512 MB of RAM and 4 GB of storage, and has a 315mAh battery, which, according to Samsung, enough for more than a day on the road. Connecting to your phone via the new energy-efficient Bluetooth 4.0 LE. It also comes with a 1.9 megapixel camera that is able to capture video at 720p. Galaxy Gear will be available later this month in most countries of the world, while the U.S. and Japan will have to wait until October. Price is set at U.S. $ 299.